Selling your product or service requires completing the series of steps or phases that make up your sales cycle. 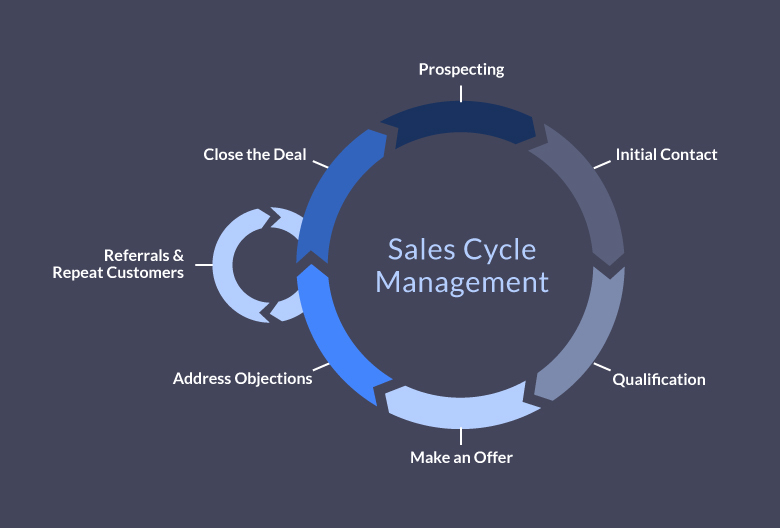 A well-defined sales cycle can help you streamline your sales process, increase sales velocity, and more accurately forecast close dates and incoming revenue. The length and stages of your sales cycle depend on your industry, product, price point, and customer profile. For example, your sales cycle could begin when you establish contact with a potential customer and end when they make a purchase. Alternatively, your sales cycle could start when you buy a list of leads and end after you’ve signed a contract and gotten a solid referral from your new customer. This article will help you define, measure, and optimize your sales cycle. Though the specifics vary between companies, industries, and target markets, there are several key elements found in many business’ sales cycles. Consider that the visualization of the steps in your sales cycle are also referred to as your sales pipeline. Before you can sell anything, you need someone to sell to. Use your ideal customer profile as a guideline and build a list of contacts who have potential to fit the bill. This might involve a warm introduction, buying a list of leads, or researching leads online to find their contact information. The next step is reaching out to your contacts, typically via phone call or email. The goal here is to introduce yourself and your company, but also to open up a dialogue about the prospect’s needs and challenges. Be friendly, supportive, and work to build rapport. To find out whether a prospect is a good fit for your product or service, learn as much as you can about their pain points and identify their needs. Ask qualifying questions, research their company, and develop a lead scoring model (or use an established model like the BANT framework) to gage their likelihood of becoming a customer. Deliver your pitch and present a tailored offering designed to appeal to the specific needs of the prospect. If the pitch goes well, this stage can also involve sending over a proposal for them to review. Expect your prospects to have concerns, questions, and even objections about offering. Whether they voice hesitations related to price, timing, or the solution itself, this is your chance to listen and learn about their pain points. Reframe sales objections as an opportunity uncover more about your prospect’s needs, and then reposition your offering to meet those needs. Closing the deal is both an art and a science. Hone your closing techniques so you can get total buy-in from your prospect and sign them on as a new customer. Make sure your customers are happy with their purchase and follow-up to see if there’s anything you can do to help them get the most out of your product or service. If they’re completely satisfied, this is a great opportunity to ask for referrals or secure repeat business. The length of your average sales cycle reveals quite a bit about your business. In many cases, tracking sales cycle length provides insights that can be used to optimize the sales process. For instance, you might find that certain types of customers get stuck at certain stages, thereby prolonging the sales cycle. However, the longer it takes to close a deal, the more costly your sales process becomes in terms of time, energy, and company resources. Faster sales equal faster paydays. 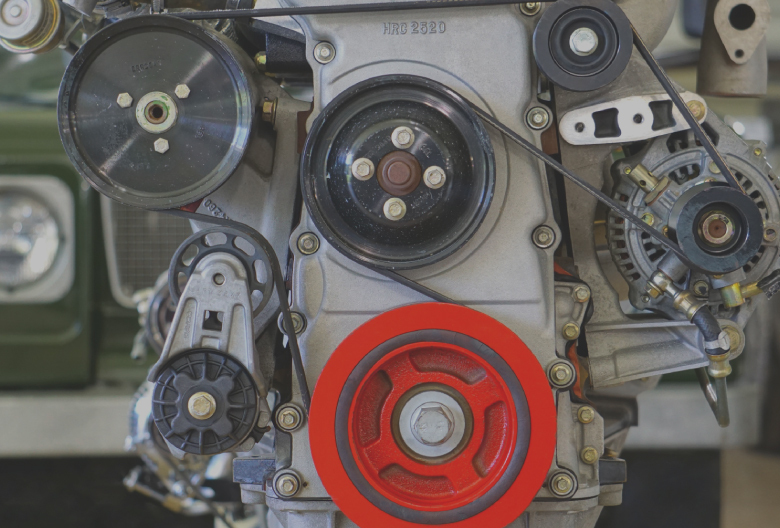 So, if you can pinpoint where in the cycle your deals tend to stall, you can look for ways to resolve or reduce bottlenecks – and thereby speed up your entire sales process. 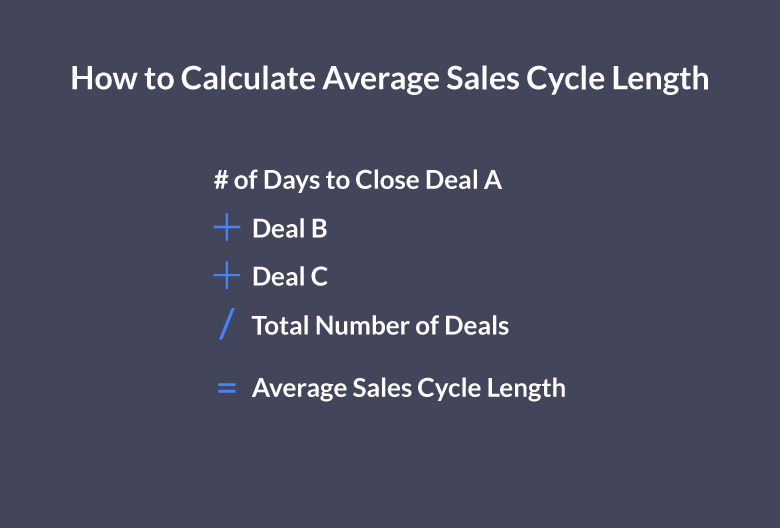 Estimating sales cycle length requires looking at data from past sales and calculating the average number of days from the beginning to close the date. The first step is to add up the total number of days it took to close every sale in the week, month, quarter, or year you want to measure. Then, divide the sum by the total number of deals. To find out your average sale cycle, you’d simply add the length of each deal together for a total of 40 days for all sales combined. Then, divide the number of days by the number of deals to get the average length in days. With this metric, you can estimate that similar deals in the future will take around 13.3 days to close. This gives you an advantage when it comes to forecasting future revenue and predicting close dates. When Should Your Sales Cycle Officially Begin? When it comes to measuring your sales cycle length, there are a couple different schools of thought. One particular point of contention is determining when the sales cycle actually begins. When a contact first enters your CRM. When you first contact a new lead. When a lead converts into an opportunity. Tracking your sales cycle from the moment a new lead is created in your CRM is known as first touch attribution. Those who use this method are often focused on optimizing top-of-funnel activities, like lead gen and prospecting. On the other hand, starting your sales cycle when you first contact a new lead excludes prospecting from the measurement. This might be a better option if you buy lists of leads and enter them into your CRM before you’re actually ready to contact them (perhaps because you need to do further research but want to store their contact information in your system). Finally, some companies prefer to start their sales cycle when a lead converts into an opportunity. The result is fewer stages in the sales cycle, which is beneficial for teams that want to home in on optimizing the negotiation, closing, and follow-up stages. However, it only works if your team has crystal clear understanding of the difference between leads and opportunities. Whatever starting point you choose, make sure your entire team is clear on which specific activity initiates the sales cycle. Consistent tracking is key to calculating an accurate average length and identifying how changes in the sales process can be used to shorten your sales cycle. Focus your energy on sales qualified leads (SQLs) that your marketing team or SDR has vetted and considers ready meet with a quota-carrying sales rep. Otherwise, you’ll waste time on leads that don’t go anywhere. Be upfront about your pricing. This allows you to weed out leads without a proper budget, build trust from the start, and helps prospects understand the full value of your solution. Use social proof to bolster your reputation. It takes time to win over a potential customer, but you can do so much quicker if you share positive testimonials and reviews from their peers. Whether you manage to score a warm introduction or showcase case studies on how you’ve helped similar companies, social proof can help you close faster. Replicate past successes. Reflect on which channels have provided you with the best leads, which pitch styles land the most deals, and what your top reps are doing that the rest of your team can learn from. Use your past experience to guide future decisions on where to focus your energy and resources to maximize success and speed up your sales cycle. Identify objections early in the process. Understanding sales objections can give you more context and help tailor your pitch to the prospect’s needs. So, find out what might hold them back from committing to a purchase and address those objections ASAP. Refine your closing strategy. Becoming a more confident closer comes with practice, but you can also speed up your sales cycle by learning and employing a few proven closing techniques. Automate repetitive tasks to save time. Use technology to automate time-consuming tasks so you can focus on selling. With Propeller CRM, you can automate repetitive tasks like data entry, scheduling follow-up reminders, and reporting. When you dedicate more of your energy and resources to moving deals forward, you can shorten your sales cycle and sell more, faster. Start using Propeller for free today to see for yourself!